But it's the two men's worlds-apart approaches to campaign finance that could be what sets their race apart nationally and play a role in whether key national Republican and Democratic organizations choose to invest in the race next year. U.S. Senate races are typically expensive beasts that fit into a complicated, multi-state strategy run out of Washington. Typically, a candidate in a competitive Senate race is expected to raise at least a million dollars a quarter. 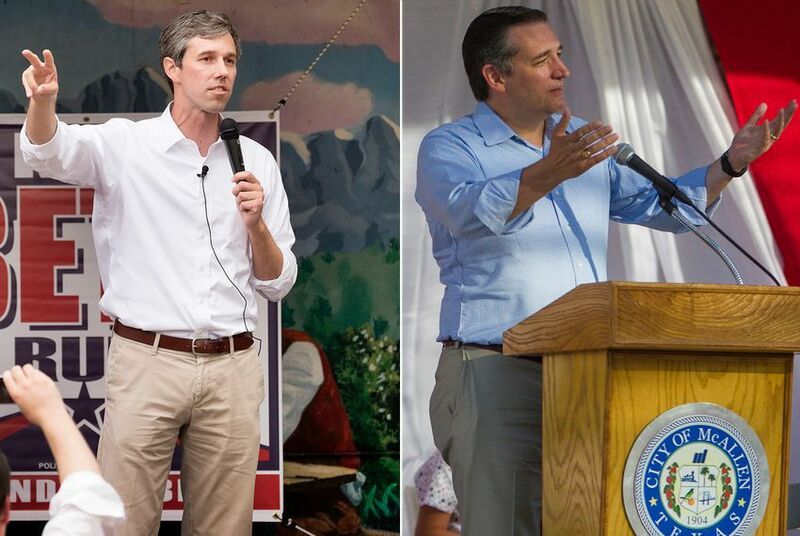 Earlier this month, both O'Rourke and Cruz reported raising nearly identical amounts, about $1.7 million apiece, with Cruz raising an additional approximate $300,000 through a joint committee and a leadership PAC. In the context of one of the most expensive media markets in the country, that’s small change. Yet that O'Rourke can keep up with the incumbent shows an early enthusiasm for him that Democrats hope to see snowball in the coming months. Aside from a candidate's direct fundraising, U.S. Senate candidates usually hope to draw support from three other groups. First, there’s the Senate's campaign arms, known as the National Republican Senatorial Committee and the Democratic Senatorial Campaign Committee, which may book millions in television advertising behind candidate if they view such efforts as worth the investment. O’Rourke has made campaign finance reform a central part of his platform. He has vowed to not take any money from PACs, prompting derision from some campaign veterans who argue he's giving up any serious chance of defeating Cruz, who proved in his 2016 presidential run to be a fundraising juggernaut. But in an interview with The Texas Tribune, O'Rourke took his hard-line approach to campaign finance reform a step further, insisting that he hopes no millionaires or billionaires form an unaffiliated super PAC to sway the race for him. That's likely to set a sharp contrast from Cruz, who rose to power, in part, with support of super PACs and is expected to draw strong support from such groups next year. Groups like the Club for Growth Action super PAC spent big on his long-shot 2012 race for a U.S. Senate seat that catapulted him onto the national stage. While it's not clear national Democrats or other groups will bolster O'Rourke's bid, Cruz is framing the race to supporters as if such involvement is inevitable. "The Democrats want to win this seat so they can make Chuck Schumer majority leader," Cruz said at Republican conference Friday in Dallas, referring to the Democrats’ leader in the Senate. Despite the enthusiasm around O'Rourke's bid, a Texas Democrat hasn't won statewide since 1994 and the Democratic Senatorial Campaign Committee and many like-minded national groups remain unlikely to invest in it. So is this even a race? It's fair to say former state Sen. Wendy Davis knows the usual Texas donors, going back to her 2014 race against now-Gov. Greg Abbott. She recently saw signs at an Austin fundraiser that O'Rourke's campaign could fare better than her 20-point loss. “I didn’t recognize a lot of people in there,” she said. “To me, that was a really good sign that people are stepping up." Yet even if O'Rourke can hold his own against Cruz in terms of fundraising, Democrats have not fielded a serious candidate for governor, and Abbott has tens of millions of dollars to support his re-election bid. And Cruz is a former presidential candidate who raised more than $90 million in $2,700 or smaller increments. While he surely stumbled among his party's base last year when he refused to endorse Donald Trump for president at the Republican National Convention, he’s made strides since then to consolidate support. In a change of pace from past campaigns, U.S. Sen. John Cornyn, a fellow Texan and the second-ranking Republican in the chamber, endorsed Cruz for re-election last month. A former Trump White House official, Steve Bannon, has promised to back a primary challenge against every Republican in the Senate except for Cruz. That's created a volatile atmosphere in Washington. Democrats say they see strong indications that the GOP’s civil war and anti-Trump sentiment could put normally safe red states into play.